*SYDNEY RYE MYSTERY BOX SET (Books 1-3): A Vigilante Crime Mystery Series- Crime Suspense Thriller (Deal, Not Free) by Emily Kimelman. Price: $0.99. Genre: Steamy Mystery Box Set Deal of the Day, Sponsor, 18+, Hard Boiled Mystery, Cozy Mystery. Rated: 4.4 stars on 26 Reviews. 591 pages. ASIN: B00C44C6RU. Reviewers love it: This is a heartfelt mystery thriller about a heroine and her dog fighting for justice. The series has everything – a strong female lead, adventure, travel and the best dog imaginable! Awesome books! The author weaves a very interesting plot throughout the series and the heroine is an overachiever with fantastic deductive and physical abilities. I was so happy with the series! Keep them coming! The author is on the same level as Stephanie Plum! *Montana Mail Order Bride Box Set Books 1 – 3 by Linda Bridey. Price: Free. Genre: Historical Romance, Victorian, Western. Rated: 4.6 stars on 32 Reviews. 510 pages. ASIN: B00MGVQ9QK. $1 Hard-Boiled Mystery Box Set Deal! 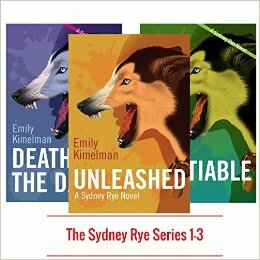 *SYDNEY RYE MYSTERY BOX SET (Books 1-3): A Vigilante Crime Mystery Series- Crime Suspense Thriller (Deal, Not Free) by Emily Kimelman. Price: $0.99. Genre: Mystery Box Set Deal of the Day, Sponsor, 18+, Hard Boiled Mystery, Cozy Mystery. Rated: 4.4 stars on 26 Reviews. 591 pages. ASIN: B00C44C6RU. Reviewers love it: This is a heartfelt mystery thriller about a heroine and her dog fighting for justice. The series has everything – a strong female lead, adventure, travel and the best dog imaginable! Awesome books! The author weaves a very interesting plot throughout the series and the heroine is an overachiever with fantastic deductive and physical abilities. I was so happy with the series! Keep them coming! The author is on the same level as Stephanie Plum! The Brides Of Paradise: Standalone Stories 1-3 by Grace Heartsong. Price: Free. Genre: Christian Romance Box Set, Western & Frontier, Victorian. Rated: 4.3 stars on 4 Reviews. 174 pages. ASIN: B01C64WZMS. *Swift and Python Programming Guide: Programming Language For Beginners: Learn in a Day! Box Set Collection (Swift, Python, JAVA, C++. PHP) by Os Swift. Price: Free. Genre: Education & Reference, Introductory & Beginning, Beginner’s Guides, Python, Swift, Business. Rated: 5 stars on 6 Reviews. 370 pages. ASIN: B01DC9FNHA. Locked In by Myra Song. Price: Free. Genre: Steamy Romantic Suspense, Collections & Anthologies. Rated: 4.8 stars on 12 Reviews. 151 pages. ASIN: B01AWQFJMA. Shapeshifter Menage Collection by Rachel S. William. Price: Free. Genre: Fantasy Box Set Series, Fantasy Steamy Romance, Multicultural, Paranormal. Rated: 4.5 stars on 4 Reviews. 702 pages. ASIN: B01DOIB1D4. $1 Gripping Military Thriller Box Set Deal! 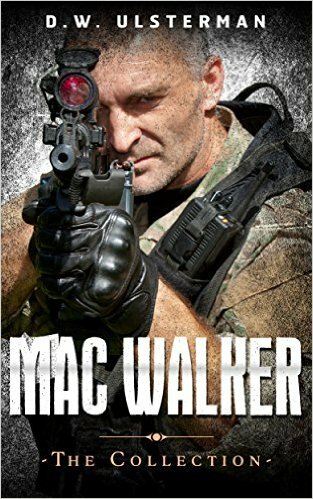 *Military Fiction: THE MAC WALKER COLLECTION: A special ops military fiction collection… (conspiracy,apocalypse,thrillers,military fiction) (Deal, Not Free) by D.W. Ulsterman. Price: $0.99. Genre: Military Thriller Box Set Deal of the Day, Sponsor, Conspiracy Thriller, 9 Book Box Set Deal, War, Spies & Politics. Rated: 4.2 stars on 111 Reviews. ASIN: B00HQ9Z8WS. Reduced to $0.99 from regular list price of $6.99 (nine-volume collection)!! Reviewers love it: Live Free or Die Fighting for Freedom! 9 Gritty military fiction thrillers with government cover-ups, bad guys, some hot & tough women, and of course the awesome Mac Walker! Should be required reading for all high school students! Great Collection! Great Set of Books! I love this series! By far the best collection of stories I have had the pleasure of reading! Good Series, Highly recommend it! 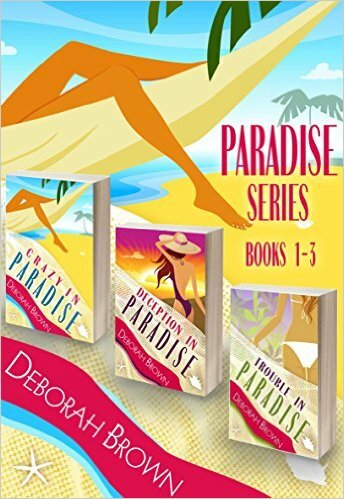 *(Box Set Deal, Not Free) Paradise Series: Paradise Series: 1,2,3 Crazy in Paradise, Deception in Paradise, Trouble in Paradise Box Set (Deal, Not Free) by Deborah Brown. Price: $0. Genre: Romance Box Set Deal of the Day, Sponsor, Romantic Suspense. Rated: 4.6 stars on 18 Reviews. 626 pages. ASIN: B00YFY438W. Reviewers love it: I truly couldn’t get enough! With this set of books, you have a dandy trio that will consume your summer reading. It has some lessons for life subtly hidden in the action, romance and thrills! I loved every book in this series! It will leave you smiling! I highly recommend this set not because you get the three books for the price, but you also move seamlessly from a story to the next! Homemade Skin Care Box Set (6 in 1): Easy Organic Lotions and Body Scrubls for Your Healthy Luxurious Skin (Organic Body Care & DIY Lotions) by Natasha Singleton, Annette Marsh, Piper White, Marisa Lee, Pamela Ward, Carrie Bishop. Price: Free. Genre: Beauty, Grooming, & Style, Candlemaking, Soap Making. Rated: 4 stars on 5 Reviews. 302 pages. ASIN: B01A33BVRY. $1 Heartwarming 3 Book Cozy Mystery + Romance Box Set Deal! Excellent $1 Mystery Box Set Deal! *Paradise Series: Paradise Series: 1,2,3 Crazy in Paradise, Deception in Paradise, Trouble in Paradise Box Set (Deal, Not Free) by Deborah Brown. Price: $0.99. Genre: Mystery Box Set Deal of the Day, Sponsor, Suspense Thriller, Romance, Women’s Adventure. Rated: 4.6 stars on 18 Reviews. 626 pages. ASIN: B00YFY438W. Reviewers love it: Deborah Brown’s books are infectious! She has a joie de vivre that pours out of every page of her books! Gratifying! I can’t get enough of this! With this set of books, you have a dandy trio that will consume your summer reading. I was instantly impressed by this author’s writing style! I loved every book in this series! It will leave you smiling! ***A Brand of Christmas by Maggie Shayne. Price: Free. Genre: Contemporary Romance, NY Times Bestselling Author, Holidays, Western, Westerns. Rated: 4.5 stars on 1,095 Reviews. 439 pages. ASIN: B0170SMIR2. NY Times Bestselling Author Maggie Shayne. *Point Watcher Box Set: Four Weight Loss Cookbooks In One (Point Watcher Diet Recipes) by Terry Adams. Price: Free. Genre: Slow Cookers, Weight Loss, Special Appliances, Low Fat, Slow Cooking. Rated: 5 stars on 7 Reviews. 188 pages. ASIN: B01CMSAP70. *Cozy Mysteries & Mystery Books Box Set by Hope Callaghan. Price: Free. Genre: Cozy Mystery, Women Sleuths, Anthologies. Rated: 4.8 stars on 16 Reviews. 417 pages. ASIN: B01BJBJUG8. $1 Clean Romance Box Set Deal! 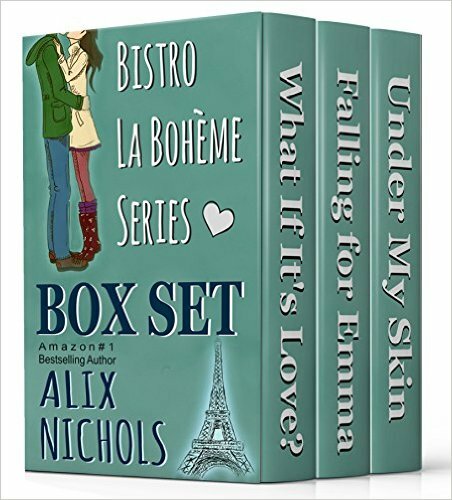 **Bistro La Bohème Box Set: What If It’s Love?, Falling for Emma, Under My Skin (Bistro La Bohème Series) (Deal, Not Free) by Alix Nichols. Price: $0.99. Genre: Clean Romance Box Set Deal of the Day, Sponsor, Humor, New Adult & College Romance, Inspirational Romance, Women’s Fiction. Rated: 4.5 stars on 58 Reviews. 737 pages. ASIN: B00VY6BOKY. Reviewers love it: Funny and cute! Besides getting three wonderful love stories, you get to “see” some of Paris and Russia! If you are looking for a well-written series to read, this is it! The author had me smiling and chuckling at the twists and turns! You can fall in love with it over and over again! A great addition to your romance collection! ***The Vampire Hunter’s Daughter The Complete Collection (Parts 1-6) by Jennifer Malone Wright. Price: Free. Genre: Fantasy, Paranormal & Urban. Rated: 4.5 stars on 162 Reviews. 220 pages. ASIN: B008ASVXR8. Awesome $1 Fantasy + Romance Box Set Series! *The Veil Series (Books 1 – 3): A Muse Urban Fantasy (Deal, Not Free) by Pippa DaCosta. Price: $0.99. Genre: Fantasy Romance Box Set Deal of the Day, Sponsor, Paranormal & Urban Fantasy, Paranormal Romance. Rated: 4.7 stars on 20 Reviews. 690 pages. ASIN: B00ZLRPYBC. Reviewers love it: The entire series is completely amazing! Fabulous! Fast paced, with a lot of action! Lift the veil and see what is behind the cover! Trust me, you will love this series! Pippa DaCosta spins a bowl of spaghetti that has the reader never knowing where the next turn will be! Awesome series! I wish there were more! $1 NY Times Bestselling Author Complete Boxed Collection Romance! ***(Box Set Deal, Not Free) The Billionaire’s Obsession: The Complete Collection Boxed Set (Mine For Tonight, Mine For Now, Mine Forever, Mine Completely) (The Billionaire’s Obsession series Book 1) (Deal, Not Free) by J. S. Scott. Price: $0.99. Genre: Adult Romance Box Set Deal of the Day, Sponsor, NY Times Bestselling Author, Collections & Anthologies, Anthologies, New Adult & College, Literature & Fiction, Contemporary. Rated: 4.3 stars on 2,701 Reviews. 288 pages. ASIN: B00BMHUDP2. NY Times Bestselling Author J.S. Scott. Reviewers love it: This collection was out of this world from the first page! Touching and heartfelt! This book will hook you from the start! It is a beautiful story about finding true love! I didn’t want it to end! Phenomenally intense! Their story made me smile! 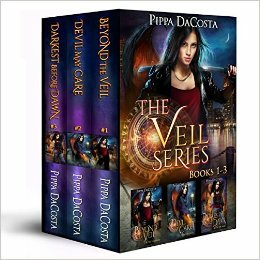 *(Box Set Deal, Not Free) The Veil Series (Books 1 – 3): A Muse Urban Fantasy (Deal, Not Free) by Pippa DaCosta. Price: $0.99 Genre: Fantasy Romance Box Set Deal of the Day, Sponsor, Paranormal & Urban Fantasy, Paranormal Romance. Rated: 4.7 stars on 20 Reviews. 690 pages. ASIN: B00ZLRPYBC. Reviewers love it: The entire series is completely amazing! Fabulous! Fast paced, with a lot of action! Lift the veil and see what is behind the cover! Trust me, you will love this series! Pippa DaCosta spins a bowl of spaghetti that has the reader never knowing where the next turn will be! Awesome series! I wish there were more! *Private Detective: BENNINGTON P.I. : A Four-Book private detective series collection… (Deal, Not Free) by D.W. Ulsterman, Private Detective. Price: $0.99. Genre: Mystery Box Set Deal, Sponsor, Collections & Anthologies, Private Investigators. Rated: 4 stars on 22 Reviews. 914 pages. ASIN: B00J140ZTW. Reviewers: Wow! This collection is superb! Stunning! As with his previous books, Mr. Ulsterman continues to weave thrilling tales! I read through all of the collection without stopping and very highly recommend this writer and these books! What a fantastic hard-boiled detective series! At nearly a thousand pages, a really great deal!